Super fresh homescreen. Search bar. Swipes. And more…. The first time we changed our homescreen, it ended in disaster. It was 2014. Two years after we’d first launched Transit in the App Store. We had a giant list of planned improvements. Time to reimagine everything, we chanted. So we did. We reimagined everything in Transit. 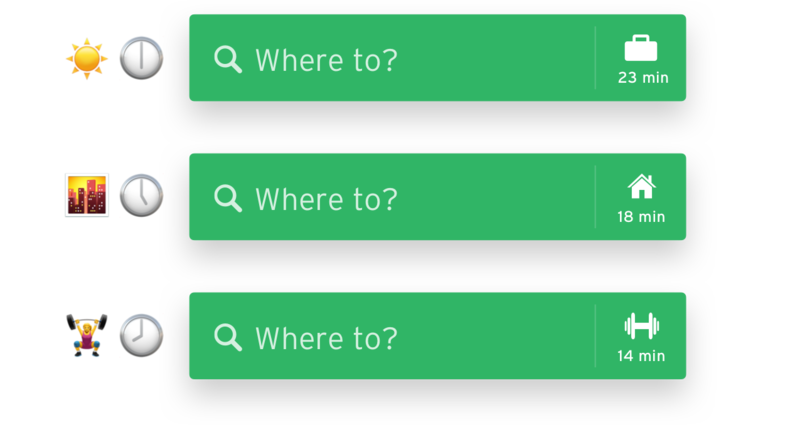 We took our homescreen’s colourful list of transit ETAs, known as “Nearby”, and snuck it behind a big map with buttons. Transit 2.0 (left): Nearby’s transit departure times, right on launch. 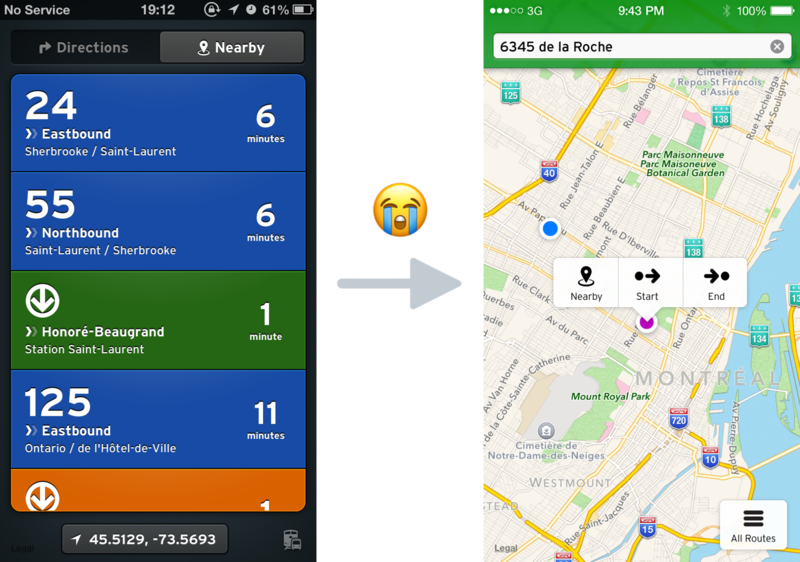 Transit 3.0 (right): we had big plans for our homescreen’s map — so we hid “Nearby” behind a button. Almost 20% of our users stopped using Transit. We learned something that day. Homescreens are sacred. They’re your identity. Change your homescreen, users will end up feeling catfished. Sometimes a homescreen redesign is a necessary, drastic last measure. But for most apps (like Transit) radically changing your homescreen is like throwing the baby out with the bathwater, bathtub, and bathrobes. So when we started plotting Transit 5.0, we knew continuity was key. Nobody was messing with the homescreen this time. In this update, we’ve fixed long-standing issues and made our app more powerful. But we’ve kept the important parts in place. You won’t feel lost when you open 5.0. You’ll feel right at home. Except now, your home is a palace. The list of nearby transit lines: still there in all its glory. But we’ve made a few subtle (albeit powerful) improvements to the homescreen. When you open up Transit, you’ll notice the search bar has moved down a bit. Phones have gotten bigger and bigger since we launched Transit in 2012. Sadly our thumbs haven’t. We moved the search bar closer to the middle of your screen, so you can search without the thumb strain. In today’s update we didn’t just move the search bar. Instant ETA: under the 🏠 icon, we’ll show you how long it takes to get to your predicted destination by transit. No taps required. Instant trip plan: tap the 🏠 icon and it’ll open the trip planner, showing you all the different ways to get to that destination. 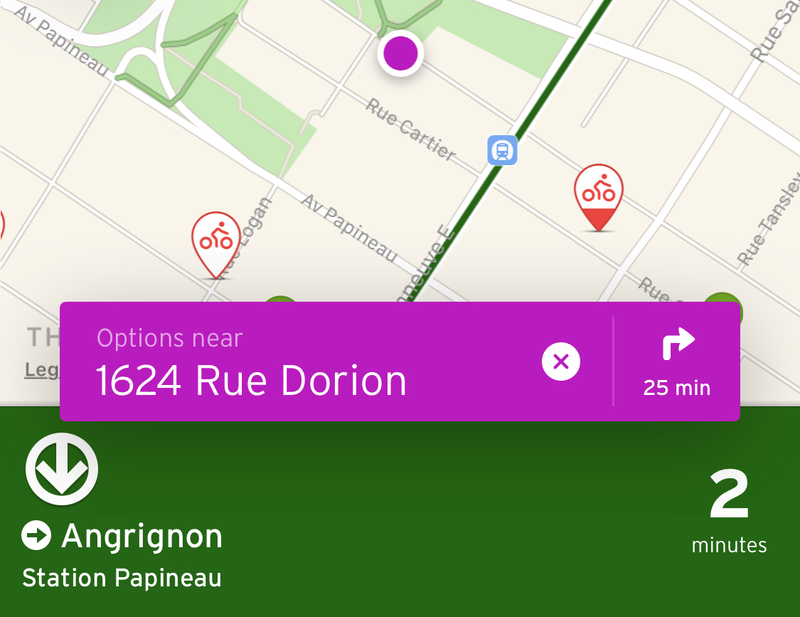 Favourite locations aren’t the only locations getting love in Transit 5.0… pan around the map with our “purple dot” and you’ll get an Instant ETA to that location as well. Just tap the ↱ button for a one-tap trip plan. And if you’re a pocket purple panner? It’s easy to forget that you’ve panned away from your current location — which messes up the departure times you see in Nearby. That’s why, starting today, whenever you’re looking somewhere that isn’t your current location, we’ll turn the search bar purple. Now, you can pan in peace. Nearby departure times are Transit’s bread and butter. But we also have fancier dishes: route maps, service alerts, vehicle locations, and transit schedules. Until today, accessing those different details required you to tap into different pages. Transit schedules on one page, route maps on another, etc. Just like a Dickens novel, our app had too many pages! We’ve simplified them, down to one: the all-powerful route screen. Tap on any line from the homescreen to get all the transit info you need in one place. It’s a feast for your eyes — one that’s readable, requires fewer taps than before, and manages to be informative but not overwhelming. Before, when you wanted to go back to a previous screen, you had to reach for a back button or an “X” at the top of the screen. Both were out of reach — unless you had two hands on your giant 50” phone… or one giant 50” thumb. Now to revert to a previous screen, you just have to swipe down. Simple. How things have changed. Mobile design has gone through several Picasso periods in the last decade. Starting with the skeumorphism of the early iPhone: heavy on shadows so you knew where to tap (tapping on a screen! what novelty!) with textures and icons reminiscent of physical objects. Then, you got flat design, a more minimal design paradigm, which scorched the shadows. After all, you’d been using your phone for a while — you knew where to tap things! Gone was the literal “bookcase” from your ebooks app. Gone was the need to make buttons look like actual buttons… text buttons worked fine. The physical references in mobile apps were no longer necessary. Make it flatter, the design gods chanted. Which brings us to today. It was about a year ago that our inner Narcissus started feeling restless. Transit looked old. Not ugly… just outdated. Other apps were replacing their flat designs 💤 with a bit more pop 💥🍾— like Uber and Apple’s Music + App Store apps— which were bringing subtle drop shadows back to the fore. We’ve added bigger text, bolder colours, and larger spacing to pull your eyes to the right places. The use of “cards” has displaced long lists of data, making it easier to skim. And yes: shadows have made a comeback, nice little accents that show you the important info right away. 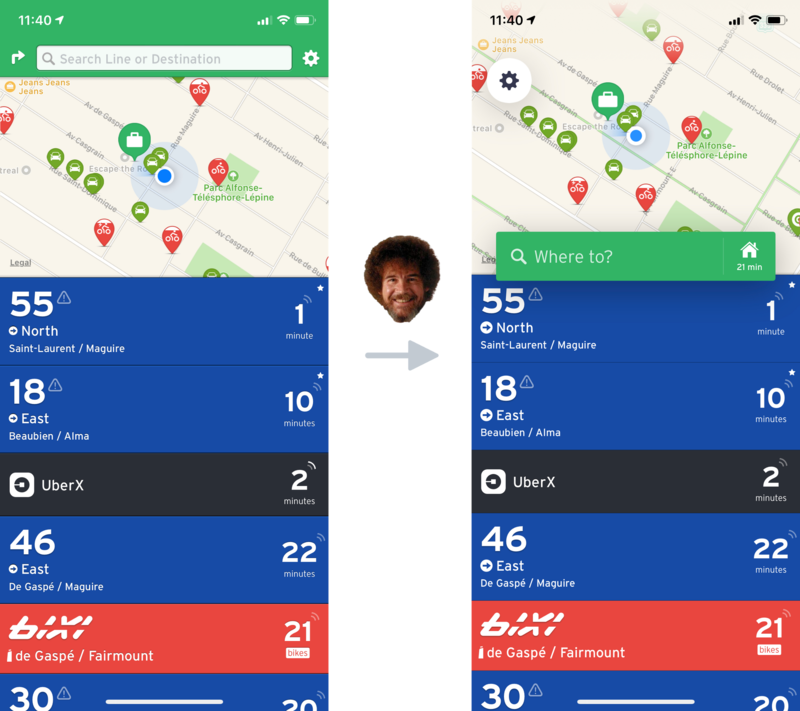 Together, these design changes make Transit more readable, more intuitive, and tangibly sexier. We recognize that the Nearby part of our homescreen isn’t just a cute little design quirk — it’s a part of our app’s identity. 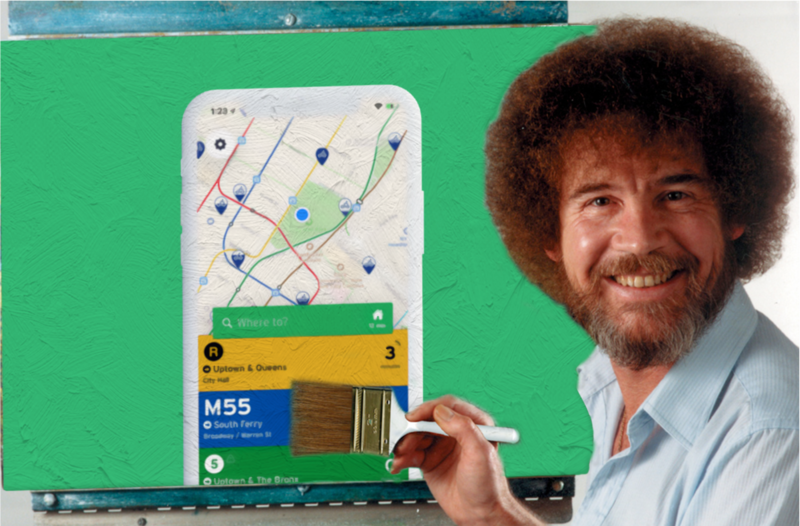 With Transit 5.0, we’ve found ways to preserve Nearby while showing other features in their best light. Features you didn’t know existed in Transit are now suddenly obvious. Information that required five taps to get is now accessible in one (or none at all!) And despite all of these functional and visual changes, we retain the familiar qualities that made you fall in love with Transit in the first place. We’re the same app. Just better. Do you have Transit installed? Yes 👉 Let us how you like the redesign on Twitter! No 👉 You’re in for a treat! Download for Android or iOS. Want to learn more about Transit? Here’s how we generate the best crowdsourced transit data. Here’s how we made the world’s sexiest transit maps. And how we help your transit agency fix their real-time data.